Happy 4th of July to my fellow Americans! And a Happy Friday to my fellow international readers, too. Last year this time, I was fresh from culinary school, still testing out recipes on people I trusted to tell me the stone-cold truth: my family. 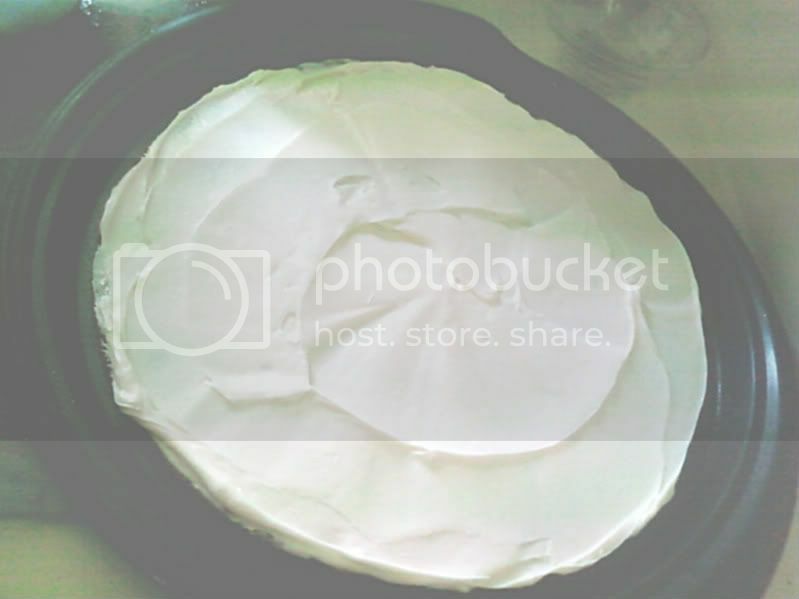 My mom handled the grill, my husband handled the napkins (I needed assurance that he wouldn't mess up anything) , and I handled quite a few things: a dirty rice salad, pineapple jalapeno salsa, red velvet cake, lemon pie, and coconut sorbet. I got rave reviews for the pie and the coconut sorbet. I received requests all year long for them. I did not oblige any of the requests. I simply was too busy making sure my husband didn't mess up any more napkin responsibilities. Today I recreated July '07 dessert greatness. Sadly, I had to leave this year's cookout early because I had to go to work, but I left my desserts at my mom's for everyone else to enjoy. Chill mixing bowl and beaters in freezer. Crush cookies in a food processor until crumbs are a fine dust. Add softened butter and pulse until mixture is crumbly. Press mixture into two pie plates, springform pan, or cake pan with a spoon or rubber spatula. Place crust in freezer while preparing filling. Pour fresh lemon juice into medium mixing bowl. Add all sweetened condensed milk, lemon zest, and stir well with a wooden spoon. Set aside. Take mixing bowl and beaters out of freezer. Pour heavy cream into bowl and beat just until stiff peaks have formed. Take care not to over whip the cream or it will curdle and break. Transfer whipped cream to lemon mixture, folding in cream to incorporate. Remove crust from the freezer and pour lemon filling into pie crust, using an offset spatula, rubber spatula, or spreading knife. Garnish top with slices of lemon, whipped cream, or appropriate flavored candies. *Using bottled lemon or lime juice is OK but I prefer not to because of the chemicals added to prolong shelf-life. *Putting the mixer bowl and beaters in the freezer prior to whipping cream will make the whipping time shorter and your peaks higher. *The whipped cream portion of this pie is optional as well. It makes the filling lighter and creamier. Without it, the pie will taste the same, only heavier in weight. *The lemon zest is purely cosmetic. It does impart flavor, but I add it so that there is no question as to what flavors are in the pie. Those cans stacked up seemed aesthetically pleasing to me. The finished product. 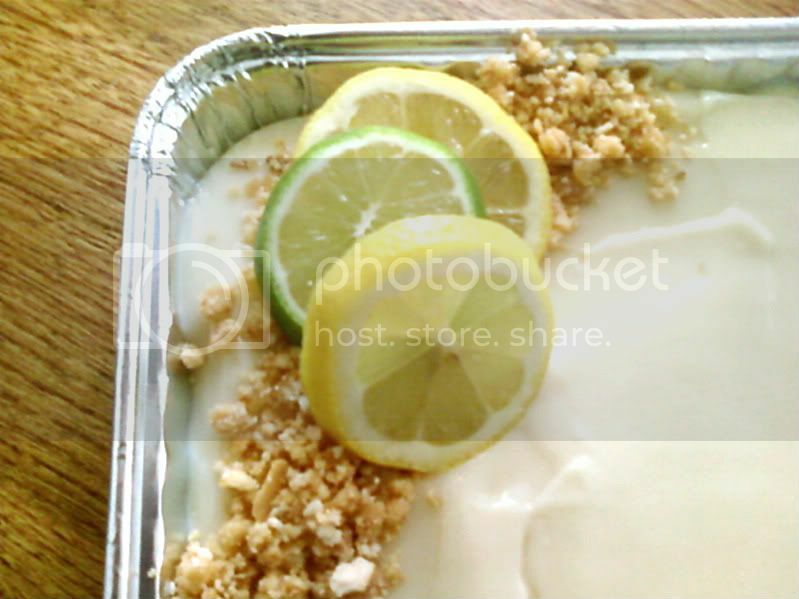 Lemon pie. The pizza is something that kids can help to do. I don't have any little ones yet, but I do have some come over from time to time to help me cook. It's a great hands-on project, especially laying down the fruit in patterns. Preheat oven to 350°F. Grease a pizza pan. Melt butter and chocolate in a medium heatproof bowl set over a saucepan of simmering water, stirring occasionally, until smooth. Whisk together flour, baking powder, and salt in a small bowl. Whisk together sugar, eggs, and vanilla in a large bowl, then pour in chocolate mixture, whisking until combined well. Whisk in flour mixture and transfer batter to baking pan. Bake until top is shiny and set and sides have begun to pull away slightly (a wooden pick or skewer will not come out clean), about 35 minutes, for fudgy brownies; or until wooden pick or skewer comes out clean, 50 minutes to 1 hour total, for cakey brownies. Cool brownies for 1 hour in pan on a rack. 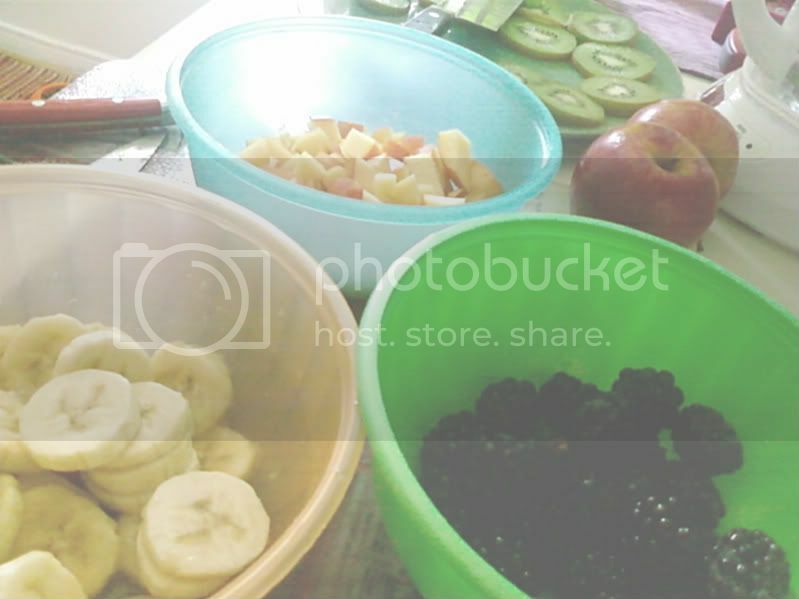 Assorted sliced and diced fruit: kiwi, cherries, bananas, mango, apples, pears, strawberries, raspberries, etc. Beat cream cheese, butter and vanilla in large bowl until light and fluffy. Gradually beat in sugar. Cover and refrigerate until firm enough to spread. After brownie has cooled, spread cream cheese frosting in an even layer. Place sliced fruit on brownie in decorative patterns. Cut into 8 or 16 thin slices and serve. *Store-bought brownie mix is OK to use in this recipe. It's definitely cheaper. *To prevent bananas, apples, or pears from oxidizing, coat with lemon or lime juice. *After frosting but before decorating pizza, place pie in refrigerator to firm up icing so that fruit will stay where you place it. The blackberries were delivered to me late last night from my good friend, Phillip. They were a bit tart, but a squirt of agave fixed that. Combine all ingredients. Put in ice cream machine. Mix according to manufacturer's directions. Place in freezer for 4 hours to firm up before freezing. 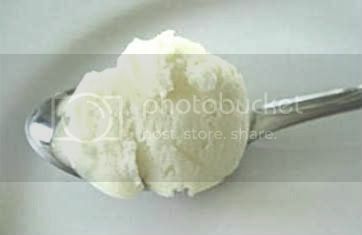 *The rum in the sorbet keeps ice crystals from forming, making a smooth and creamy product. *Overrun is the percentage of increase in volume of ice cream greater than the amount of mix used to produce that ice cream. There are formulas and calculations to predict this, but I am was not a math major. Talk to these people if you're interested in that sort of thing: here. I feel myself tipping my scale just looking at your pix. We made a brownie pizza not too long ago. We used strawberries and blueberries. That is some really tasty stuff. And I love brownies. Hope you had a pleasant holiday. Oooh, I love a good lemon pie. That makes me want to make one. Don: Thanks! I wanted strawberries and blueberries but they're not buy one get one free this week. 2 for $7 is NOT a deal. I hope you holiday was pleasant, as well. Emiline: I'm glad you like! I was inspired by some lemon bars I saw on another blog. Grat cook out recipes. I always wanted to try those fruit pizzas. I like your twist. I really like the minimalist garnish on the lemon pie. Very pretty. Sometimes less really is more! Courtney: Thanks! I went to my mom's after work and nothing was left except the garnishes, so I guess I did do a good job! Heather: Thanks to you, too. I appreciate that you noticed. What an interesting way of serving brownies - the fruit really freshens up the flavour! That sorbet looks amazing. I love love love coconut. Speaking of frozen treats, I should have my ice cream recipe posted and on it's way to you within the next 24 hours. Joelen: I love fruit, too! I always have tons of it in the house and more than half goes to waste. I need some of those green bags advertised on TV! The pizza is my way of using fruit before it gets mealy and gross. Fiona: It just makes something so decadent a little healthier. Rachel: If you love coconut, then you should really try this sorbet. It makes people swoon and roll their eyes back in ectasy. For real. Hi Nicki and thanks for visiting. 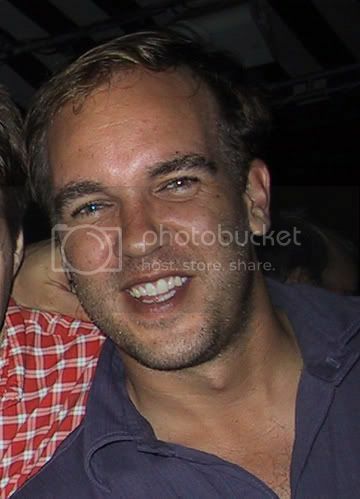 I have added you in my blogroll and will be visiting you more often. All your recipes look so good but I love the Brownie fruit pizza. It looks (and must taste) fantastic. I have a surprise (or maybe two) for you at my blog. Oh, thank you, Ivy. I can't wait to see what you have in store! 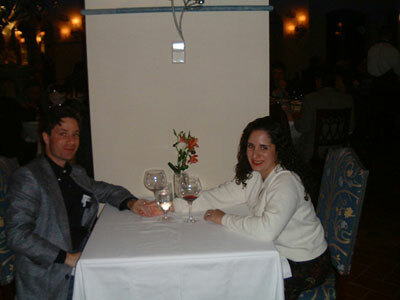 I adore your blog, so it's an honor and privilege to have you visit mine! wow, that lemon pie looks like heaven. though for me the whipped cream would be essential. 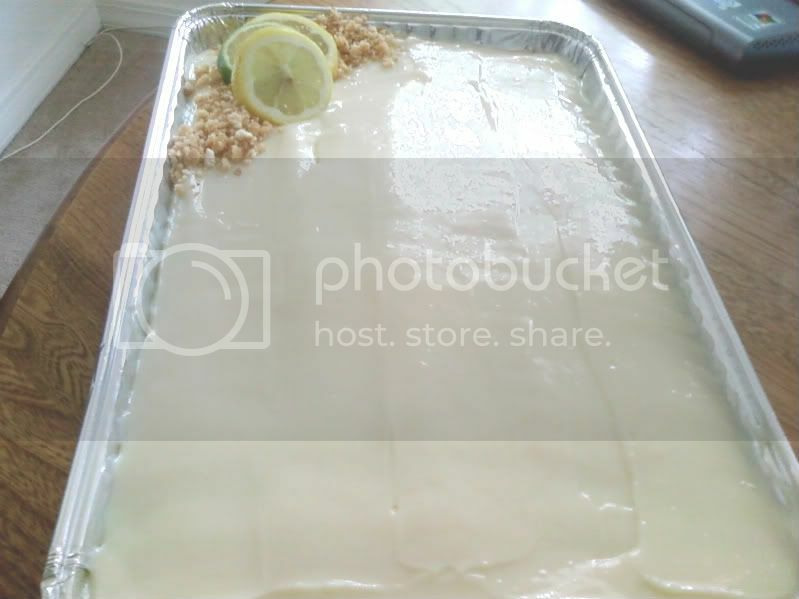 The Lemon Pie looks great. It made my mouth water. I think I'll try that..
Nikki! I'm baaaaack! :) Hey, I like the "new look" of your blog. Very much. It seems easier to read, too. In your expert opinion, do you think that I could I use Cool Whip Lite in the lemon pie? It looks wonderful, and I'm getting a bit tired of my standard key lime version. You've posted a lot since I've been away, and I'm probably going to need a few visits to get through it all-- I'll probably have more comments on some of your older posts later. Hope that you had a nice holiday weekend! Maybelles parents: Meringue is also another option. I really don't like meringue. Unless it's Italian. Then we have something to talk about. Msjena: Please don't forget to tell me how it turns out. Vicci: I' glad you like my nw digs! I worked really hard on it. 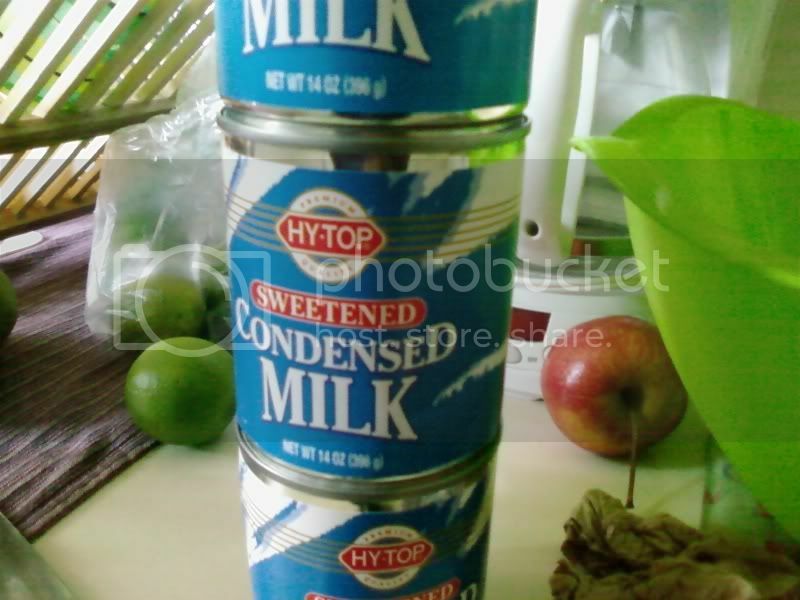 Do you want to use it in place of the condensed milk? or the whipped cream? The lemon juice might curdle the Cool Whip. If you use unflavored (or even lemon flavored would be better) gelatin and Cool Whip, I think that'd be better. Everything sounds and looks wonderful! 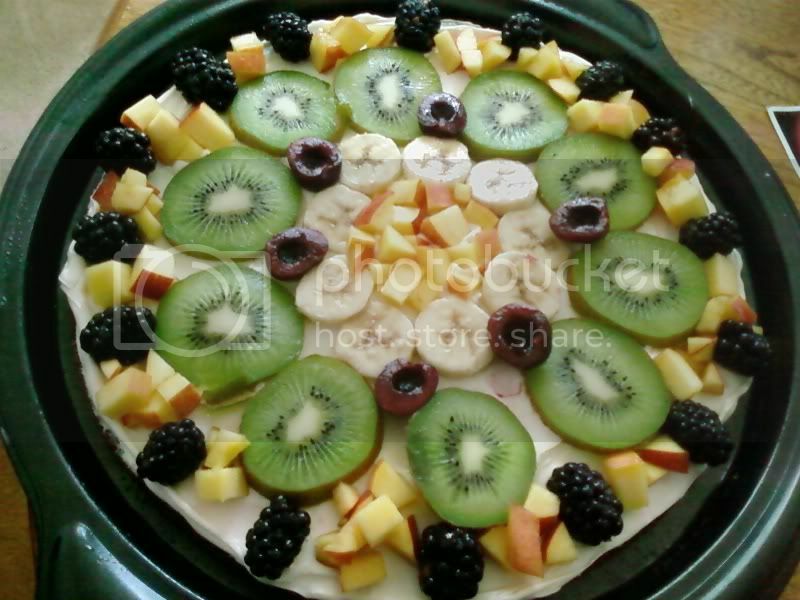 So, okay, fruit pizza is next on the must try list. It just looks so beautiful and tasty!! Just as I thought-- my comment from last evening didn't go through (darn computer, grumble, grumble...). I wanted to add the CW Lite in place of the whipped cream. I don't imagine, since it's just being folded into the lemon base, there would be a problem but I thought I'd ask. :) And with the fat-free sweetened condensed milk in the base, it might turn out to be a rather light pie! Vicci: Go ahead and try it, my friend! Please tell me how it turns out. Maybe I'll try it, too. Wow! Your blog looks fantastic. I am currently wiping the drool off my keyboard that resulted from your succulent food pics. As discussed, I will soon deliver to you organic heirloom tomatoes from my Urban Garden Project. You should come by some time and pick what you want- as long as I get to sample the Nikkified final product. Philip: Thanks, man! Your blackberries really were a hit with everyone. Call or text me the next time you're in the garden and I'll come by. Don't worry, you'll get 1st dibs on the fare--whatever it may be.